Google cloud messaging (GCM), Pushbullet, among others, allows to notify users though their mobile phone or portable device for events that where trigger either, programmatically or by any other mean. A nice self hosted solution that does not depend in form of third party services, and as far as I can see is being actively developed, is Gotify that offers a self hosted server, and mobile application for Android. Gotify offers a docker images (and unfortunately in the last few days they stopped producing the Docker image for Raspberry Pi), that allows to have a running Gotify server in less than 2 minutes. After docker pulls the image and starts it up, we can access the Notify Web Server interface at http://rpi:1080/ and access it with the default user/password admin/admin. The first thing that we need to do is to change the default admin password and add an application. Both steps are straight forward. The key aspect for the application after it is created is to take notice of the application token. This token will be necessary for inject messages on Gotify and associate the injected message to the application. Also there is the possibility to associate an icon to the application, that also be shown on the mobile application, by pressing the pen icon and adding an image. curl -X POST "http://rpi:1080/message?token=AhV-43qgmkKSj07" -F "title=RPI" -F "message=Status Alert"
Anyway, to make things short, Gotify works more or less well. I still have some issues with the web interface and with the mobile application, but those issues might be associated to being using an older version of the server. Gotify uses websockets as the transport medium for the push notifications. 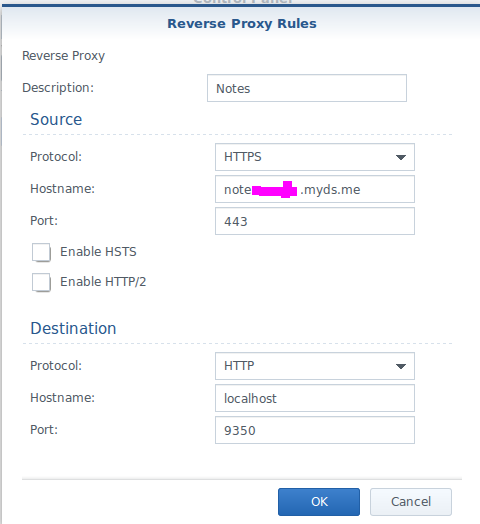 As a final note, since I’m using the Synology reverse proxy to access the Gotify server from the internet, some special configuration must be done so that the Synology reverse proxy let’s websockets to “pass through” to the Gotify server. 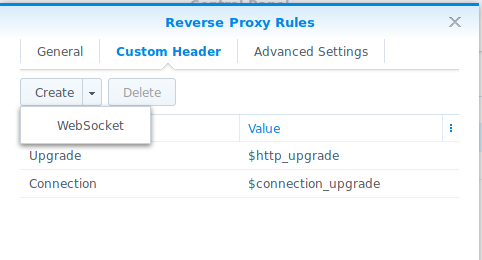 The important bit is that after creating the reverse proxy rule, we must edit and add the support for websockets by going to Custom Header and press the Create -> WebSocket button. And that’s it. We have now a self hosted notification system. We can now, for examble, by using Node-Red or bash scripts, to start sending notifications to our clients when important events happen. My internet access router has port 80, the HTTP port, blocked, which only allows to access to DSM applications and hosted sites only through HTTPS. This should be clearer, since to create a Let’s Encrypt Certificate on DSM Console I had to open port 80 and add a forward rule on the internet access router, rule which I disabled after the certification creation. Anyway, through the DSM interface, there is no way to manually renew the Let’s Encript certificate, except through the creation of a Certificate Request for a manual renewal. – First open up Port 80 on the Router and forward it to the port 80 of the Synology IP address. – Access to Synology command line prompt by using ssh. – Check now on the DSM console that all certificates where renewed. – Block again port 80 on the internet access router. As a final note, there isn’t, as far as I’m aware, a command line option to renew only a specific certificate, so when renewing, all certificates are renewed. Work is taking too much time, so I haven’t updated the blog for a long time. Anyway a series of quick posts are on the publishing queue, and this is one of the first ones. In February, my single disk installed in my Synology DS212 failed, after working for 7 long years. It still does work, but the bad sector error count is too high, and so can’t be used on the NAS anymore. Anyway, this means that I needed to replace it, and this time I replaced it with two disks for RAID 1, instead of using a single disk on the NAS. So why the long introduction? Well installing new disks implied I needed to do a full DSM install from scratch which meant that several things changed from the previous DSM version that I had and be upgraded along, as the years passed by. One of such things that changed, for the better, was the reverse proxy support using nginx and dropping the Apache http server use as the reverse proxy. What is not still able to do on the DSM interface is to map URL paths to other servers as I’ve explained on this post: Reverse proxy for URL paths. 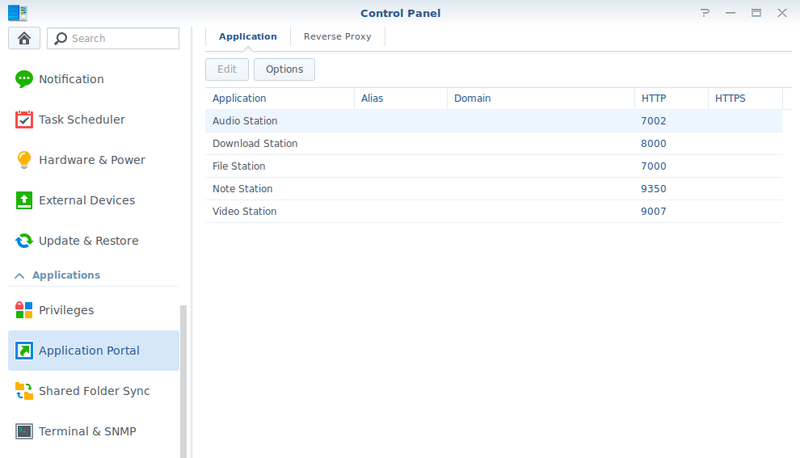 For example mapping the path /api to a back end server from the main Synology site. Still, it is quite simple to do, and here are the instructions. First we need to have ssh or telnet access to the DSM. Of course recommendation is to use ssh. Now we create in this directory a file that must have the following naming convention: www.our_name.conf. This means that on the main Web Station site, the /api is passed out to the above server, in this case the http://192.168.4.20:3001. We can check the file /tmp/nginx.conf to see if there are no errors, and if the above configuration is in the file. And that’s it, our Web Station URL path /api should be redirected to the back end server. 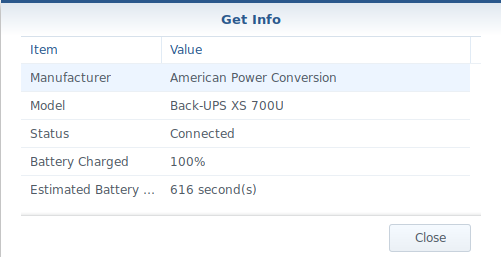 To protect data residing on my Synology NAS I’ve bought and installed an UPS, an APC 700U to be exact. The trigger for buying and installing one was the loss of (some) disk data event that happened to family member external hard disk due to power loss. The data recovery cost was higher than buying an UPS and of course the lack of backups added to outcome of that event. While no Synology NAS was involved on the above data loss, I know first hand that backups by themselves only add one layer of protection to possible data loss, and since from time to time I also have some power loss events, it was just a matter of time that my NAS might be hit by an unrecoverable power event, and, who knows, data loss. 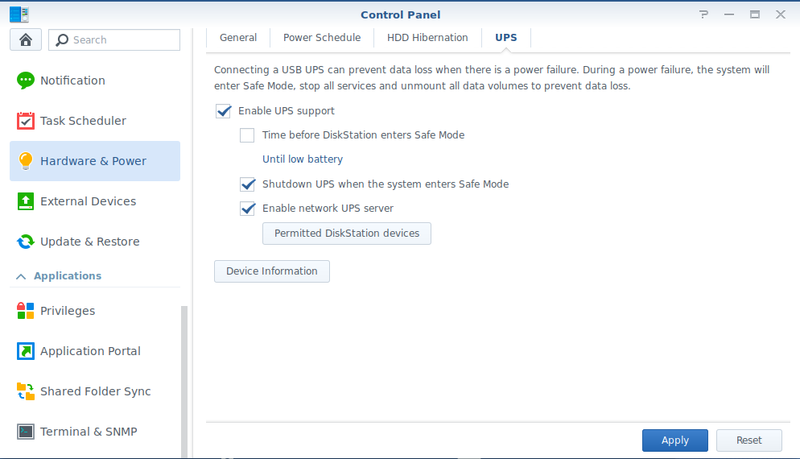 Installing the UPS is as simple as power down all devices that will connect to the UPS: Synology NAS, Odroid, external hard disks, PC base unit and network switch, and connecting an USB cable from the UPS to the back Diskstation USB ports. To end the configuration we need to press the Permitted DiskStation Devices and add the IP’s address of the devices that also have their power sources connected to the UPS and will also monitor the power status, in my case the IP of Odroid and my home PC. The above packages will install the core NUT tools and a graphical monitor. Scanning NUT bus (old connect method). after the other commented out MONITOR lines. Since I’m only monitory, I’ve just put * at the username and password for authentication. We are now monitoring the UPS status through the network. Keep in mind that the hub/switch power should also be connected to the UPS. To make the application easier to use, we can create a profile and save it, and when calling the application nut-monitor, we pass the profile name with the -F switch. The configuration steps for Odroid are the same as the Arch Linux steps, but since Odroid is running an Ubuntu variant, the files are located on a different path: /etc/nut. To start the monitoring with the new configuration we just do /etc/init.d/ups-monitor restart. If authentication is needed, on the Synology disk, check the NUT configuration files located at /usr/syno/etc/ups/. The upsd.users file has the user and password defined by default by the NUT tools on DSM. The latest Synology DSM 6.0 version now supports out of the box reverse proxy configuration. So no need to build and edit internal configuration files. Everything can be done now on the DSM web frontend. We can see that I already have some applications configured and with the HTTP internal ports defined. For example the Notes application is accessed internally by the URL http://diskstation:9350. Note that I haven’t defined a HTTPS port because I’ll use the reverse proxy as the HTTPS frontend. – I’m using one of the available domains provided by synology myds.me. – The Synology domains, at least the myds.me supports sub-domain wildcarding. So I will make the Notes application available at the notes.primalcortex.myds.me and that is the hostname that I need to define under my reverse proxy configuration. And that’s it. Just make another set of rules for the other application under their own sub-domains. In my case only HTTPS is used, so I’ve not forwarded the port 80 from the external interface of the router to the Synology. Edit: For reverse proxy URL paths, instead of full sites, this post explains how to do it in the latest DSM version. This needs to be done with the user root so ssh to the Diskstation with that user. 2nd) Connect to your Synology NAS through ssh. freeze                      Output installed packages in requirements format. show                        Show information about installed packages. search                      Search PyPI for packages. wheel                       Build wheels from your requirements. hash                        Compute hashes of package archives. help                        Show help for commands. Now we can install the modules that we need. And we can use now the paho.mqtt module on our python programs. On my previous post Synology virtual sites for FileStation and others we could see how to create new sub domains under the main DNS name for your Synology to access the DSM applications like FileStation, Notes Station, and so on. The configuration that is done creates a new full virtual site, on other words, all URL paths under the new sub domain are proxied to the redirected application. By other words, supposing that http://fs.domain.myds.me points to FileStation, all URL paths below to that URL are redirected to the FileStation site (for example http://fs.domain.myds.me/path1). And that’s because the above reason (CORS) that we need be able to proxy URL paths, and not full virtual sites, as the previous post as pointed out above. To do this is quite simple, and the conditions are that the redirected path will be redirected from the main Synology user site. After that accessing http://domain.myds.me should work as usual, but http://domain.myds.me/api should be redirected to the backend server. And that’s it, we can now host JQuery and/or Angular sites that use REST services hosted on the Synology Apache server. There also some caveats regarding this configuration, if serving another site, not a REST api, like the full/relative paths issue with the proxied site, and also, regarding REST, the use of the Accept-origin header. But for the simplest purpose of hosting the site and the REST api under the same domain name, this works fine.